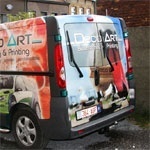 The Antwerp company Deco Art was established 19 years ago as a specialist in lettering and digital printing. The company has recently decided to adopt Mimaki’s UV LED technology in order to supply its clients with vehicle lettering, sign boards and displays. Han Marree continues: "The machine produces no odours and is much more energy efficient; it is the ideal successor to my eco-solvent printer. We print with flexible UV inks mainly on cast foil for vehicle lettering. Approximately 70% of our activities involve lettering. We also produce a considerable number of sign boards. The machine can be converted from roll to flatbed in just a few minutes by using the tables. I can see a myriad of opportunities with UJV, as the machine can print directly onto almost any material, including uncoated media and heat sensitive substrates that would normally distort quickly as a result of the heat produced by the UV lamps. The option to print with white ink onto transparent materials such as PET and plexiglass is another interesting feature. Mimaki’s lower ink consumption, compared to the eco-solvent printer, is nice to have but not necessarily of overriding importance. Deco Art bvba. 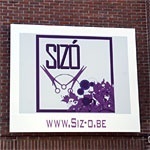 is located near a main road in the centre of Ekeren and is, therefore, an easily accessible supplier of total solutions with respect to vehicle lettering and digital printing. The company was established in 1990 and started with one employee. Nowadays the workforce comprises five employees, usually three people working in-house and two at locations in the field.